One perennial problem with most web browsers is that due to a lot of extensions, plug-ins and graphics they run, the speed of surfing and the computer’s battery are compromised. Opera wants to address these problems with new updates the company just rolled out to its web browser. But in its initial release, the feature will be available only to the developer version of the updated Opera browser for Windows and Mac computers, and it is not yet clear when the company would roll it out to the general user. Recall that Opera took two months to roll out the ad blocking feature to all users. 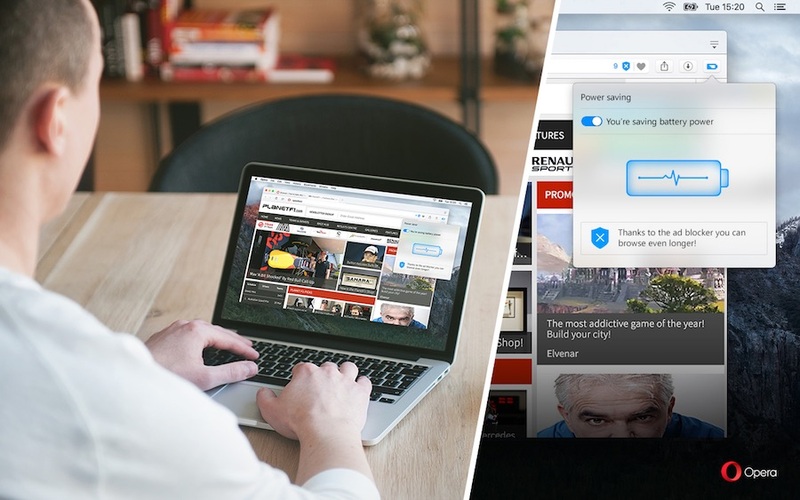 The faster browsing experience with the updated Opera browser might have been aided in no small way by the recent addition of a native ad blocker to Opera, as ads are among the factors that consume most of the battery’s energy. Combined with the low-power mode feature, the browser is expected to deliver the best experience to users. During the testing phase of the updated browser, for example, Opera found that the computer it used gained an extra hour of battery life using the browser. The computer is a Dell XPS 13 t that is based on Intel Core i7, with the browser’s ad blocking featured enabled. But the results could vary a little bit if another computer was used, probably. Nonetheless, the test result indicated a major development in Opera’s move to cater to the demands of users who, for a long time now, seemed to have had enough of time-consuming browsers, not least of them Google Chrome and Mozilla Firefox. Losing battery power in the middle of some important task while you are outside is a frustrating experience, especially if you’re out on a travel far away from home. In introducing the low-power mode feature, Opera tweaked some code in the browser and optimized the browser’s animated themes, while background activities have been reduced when multiple tabs are opened. The websites you constantly visit such as Facebook will no longer levy a burden on your PC, as Opera also infused a smart memory management feature to the browser.